Programmers from ITMO University created a computer algorithm that allows tourists to find places of interest that are most popular with locals based on their instagram posts. To test the algorithm, the team analyzed Instagram photos taken in Saint Petersburg and compiled a list of museums, cafes, streets, and event venues preferred by the residents of Russia’s northern capital, thus providing local suggestions to tourists. People tend to photograph memorable moments or places. Therefore, social networks, such as Instagram, are constantly becoming more and more popular. There are more than 700 million active Instagram users around the world. In most cases, people post photos either because it’s their first time visiting a place or, on the contrary, because they go there often. Programmers at the eScience Research Institute at ITMO University found a way to distinguish between Instagram users living in a city and visiting tourists based on how they post on social media. In a nutshell, the researchers discovered which locations were most loved by St. Petersburg residents. To remove tourists’ input from the analysis, the scientists chose two months of the year with the least number of visitors, that is, February and November, and collected all the posts from Instagram taken during that time in St. Petersburg. Based on each photograph that was posted, the programmers then analyzed the profiles of all the users who posted them. Tourists would usually post a bunch of pictures made in the center of the city, along the main street, while geotags of residents’ photos were scattered throughout St. Petersburg. In order to detect city residents more effectively, the scientists used official tourist statistics. According to the information from the city administration, the largest number of tourists comes from the European Union (32%) and their holidays usually do not exceed two weeks. Thus, a user was identified as a tourist if his or her posts in St. Petersburg during a calendar year were covered by two 15-day or less long windows with a gap of at least 30 days between each time period. Furthermore, the programmers excluded the 15 top tourist locations. The scientists also note that the algorithm now automatically organizes popular locations according to five categories: theaters and museums, restaurants and bars, bridges and streets, parks and other. Thus, the most popular place in the “Theaters and Museums” category was the Ice Palace, a big arena and concert venue, which was more popular than even the world-famous Mariinsky Theater in terms of the number of photographs taken there. In the category “Streets and Bridges”, the locals mostly liked the Alexander Column at the Palace Square and the Fontanka river embankment. The results of the research were presented at The International Conference on Computational Science and published in Procedia Computer Science. The testing of 10 smartphone applications and wearable devices intended to track physical activity found that most were accurate in tracking step counts, according to a study in JAMA. Despite the potential of pedometers to increase physical activity and improve health, there is little evidence of broad adoption by the general population. In contrast, nearly two-thirds of adults in the United States own a smartphone and technology advancements have enabled these devices to track health behaviors such as physical activity and provide convenient feedback. New wearable devices that may have more consumer appeal have also been developed. Even though these devices and applications might better engage individuals in their health, there has been little evaluation of their use, according to background information in the article. Mitesh S. Patel, M.D., M.B.A., M.S., of the University of Pennsylvania, Philadelphia, and colleagues recruited healthy adults at a university to evaluate the accuracy of smartphone applications and wearable devices compared with direct observation of step counts. The participants used applications and devices that were selected from among the top sellers in the U.S.: the Digi-Walker SW-200 pedometer (Yamax); the Zip and One (Fitbit) accelerometers; the wearable devices Flex (Fitbit), the UP24 (Jawbone), and the Fuelband (Nike); an iPhone 5s (Apple) simultaneously running 3 iOS applications, Fitbit (Fitbit), Health Mate (Withings), and Moves (ProtoGeo Oy); and a Galaxy S4 (Samsung Electronics) running 1 Android application, Moves (ProtoGeo Oy). “Data from smartphones were only slightly different than observed step counts, but could be higher or lower. Wearable devices differed more and 1 device reported step counts more than 20 percent lower than observed. Step counts are often used to derive other measures of physical activity, such as distance or calories burned. Underlying differences in device accuracy may be compounded in these measures,” the authors write. So much for tagging photographs with names, locations and activities yourself – a new cell phone application can take care of that for you. The system works by taking advantage of the multiple sensors on a mobile phone, as well as those of other mobile phones in the vicinity. Dubbed TagSense, the new app was developed by students from Duke University and the University of South Carolina (USC) and unveiled at the ninth Association for Computing Machinery’s International Conference on Mobile Systems, Applications and Services (MobiSys), being held in Washington, D.C.
Bao and Chuan Qin, a visiting graduate student from USC, developed the app working with Romit Roy Choudhury, assistant professor of electrical and computer engineering at Duke’s Pratt School of Engineering. 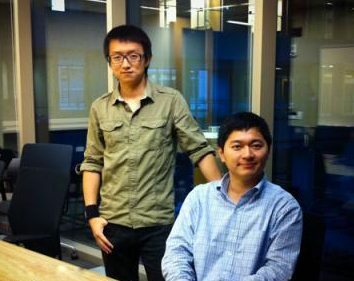 Qin and Bao are currently involved in summer internships at Microsoft Research. By using information about the environment of a photograph, the students believe they can achieve a more accurate tagging of a particular photograph than could be achieved by facial recognition alone. Such information about a photograph’s entirety provides additional details that can then be searched at a later time. For example, the phone’s built-in accelerometer can tell if a person is standing still for a posed photograph, bowling or even dancing. Light sensors in the phone’s camera can tell if the shot is being taken indoors or outdoors on a sunny or cloudy day. The sensors can also approximate environmental conditions – such as snow or rain — by looking up the weather conditions at that time and location. The microphone can detect whether or not a person in the photograph is laughing, or quiet. All of these attributes are then assigned to each photograph, the students said. Bao pointed out that with multiple tags describing more than just a particular person’s name, it would be easier to not only organize an album of photographs for future reference, but find particular photographs years later. With the exploding number of digital pictures in the cloud and in our personal computers, the ability to easily search and retrieve desired pictures will be valuable in the future, he said. The students envision that TagSense would most likely be adopted by groups of people, such as friends, who would “opt in,” allowing their mobile phone capabilities to be harnessed when members of the group were together. Importantly, Roy Choudhury added, TagSense would not request sensed data from nearby phones that do not belong to this group, thereby protecting users’ privacy. The experiments were conducted using eight Google Nexus One mobile phones on more than 200 photos taken at various locations across the Duke campus, including classroom buildings, gyms and the art museum. The current application is a prototype, and the researchers believe that a commercial product could be available in a few years. Mobile technology company Myriad will demonstrate new software next week that will allow Android applications to run on non-Android phones. Myriad also introduced virtual machine software called last year. This software speeds up performance of Android applications by up to three times and improves battery life on Android phones. Interesting to note that Nokia’s new high end phones will be running compatible operating systems. This will mean that Nokia customers will be able to run Nokia Apps and Android Apps. Not only will customers have a wider choice in Apps, but they will also be able to choose between interfaces.